Raising your limits!This is the product you’ve been waiting for Power Rock is a technological breakthrough in hydroponic and soil grown plants. You can consider this product as the ultimate yield gainer. Power Rock is the next step to really increasing your yield. Used in the 5th week of blooming, Power Rock will amazingly increase both the size and the quality of your crop. The flavor and aroma of your crop will improve unbelievably. Not only will your crop produce more flowering sites but every flower will produce more aromatic resins. Your yield will increase in mass, not only due to additional flowers, but also due to the flowers being denser and heavier. 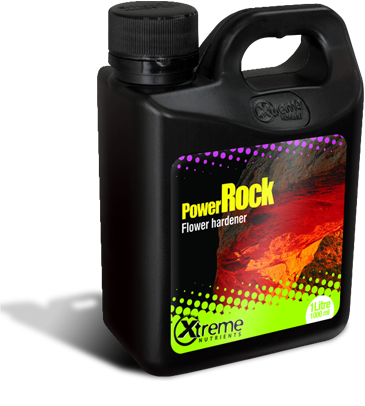 Using the latest technology in flower enhancement, Power Rock basically encourages the plant to be as reproductive as possible. This may sound unusual but in order to reproduce, your plants produce flowers. As well as producing amazingly better flowers, Power Rock will also increase your yield by at least 30%. So, by using Power Rock the end result will be significantly improved quality and greatly increased yields all from just this one incredible product. Remember, Power Rock is a concentrate, a little goes a long way, so use as directed. The limit of your yield is limited by the products you use; raise your limits with Power Rock. Power Rock can be used in several ways. Use part B of Early Turn in 3-5 days of using part A or on sight of flowering or pistols appearing. Then use Power Rock at beginning of 5th week and run for 10 days. Use Power Rock in first 3-10 days of flower at half strength. This will stop stretching and induce flowering very quickly. Then add Power Rock at full strength in week 5 and you will find you will have huge heavy flowers of the highest quality. Apply to reservoir only, (not to be used as a foliar spray). Use Power Rock at 8ml/gal in week 5 and/or 6; if you need to use more that one time, use it at 4ml/gal. Do not flush for one week. Add nutrients and water as necessary. Use 8mls of Power Rock per gallon of working nutrient solution. Ensure plants receive Power Rock solution for al least 10 days.